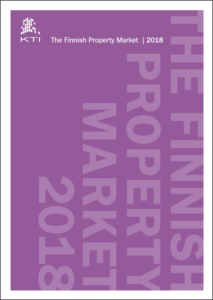 The Finnish property market continues to attract foreign investors. In 2017, foreign investor demand was mainly targeted at office and retail properties in prime locations. The positive outlook for the Finnish economy was reflected in the rental markets in 2017 both in commercial and residential property sectors. The total size of the invested property market increased to €63.7 billion at the end of 2017. The growth is mainly a result of newly developed properties in the investors’ portfolios, but in 2017, also capital growth in most property sectors contributed to the growth. In 2017, foreign investors became the largest investor group in the market with a share of 29% of the total market size. The growth in foreign investors’ investments was a result of their dominating share in the transactions market. Domestic institutions have traditionally been the dominating investor group in the market, but despite the growth of their investment portfolios in 2017, their share of the total market decreased to 25%. Domestic non-listed investment companies and property funds continued to increase their portfolios actively in 2017, and their market shares amounted to 22 and 18%, respectively. The total investments of listed property companies decreased markedly in 2017, due to the delisting of the largest listed company Sponda, following the acquisition of the company by Blackstone’s Polar Bidco. The transaction volume reached a new record in 2017, showing an increase of 38% compared to the previous record reached in 2016. The total volume was boosted by several major portfolio transactions. At the time of the transaction, the value of Sponda’s Finnish portfolio amounted to some €3.7 billion. Another large portfolio transaction was the acquisition of the European logistics property company Logicor by China Investment Corporation with its investment partners. Measured by space area, some 8% of Logicor’s portfolio is located in Finland. Supported by some other major acquisitions, the share of foreign investors exceeded 70% of all transactions. In the transaction market, office and retail properties were the most attractive property sectors with shares of 40 and 26%, respectively. The total return on the Finnish property investment market amounted to 6.6% in 2017. There were significant differences in the performance of different property sectors: hotel, office and residential properties outperformed the market on average, while negative capital growth in retail and industrial sectors pressured their performance. Helsinki metropolitan area continued to outperform rest of Finland in all main property sectors. The highest total returns were delivered by Helsinki CBD offices, where capital growth exceeded 9%, supported by both positive rental growth and yield compression. The Finnish GDP increased by some 3.2% in 2017. The growth was broadly based with exports, investments and private consumption all showing strong development. The positive outlook for the economy was reflected in the rental markets. According to the KTI rental index, office rents in Helsinki CBD increased by 3.5% in 2017. However, the high vacancy rate of offices limits the rental growth only to best locations and properties. Also residential rents continued to increase in all major cities despite the rapid increase in rental housing supply. Strong investment demand and healthy space demand boost new property development. At the end of 2017, there were some 128,000 sqm of new office space and 277,000 sqm of retail space under construction in the Helsinki metropolitan area. Read more about the structure, players, market practices and conditions in the Finnish property investment market on The Finnish Property Market 2018 -report, published today. The report is published annually in March. KTI wishes to thank the sponsors of the publication: The City of Helsinki, Colliers International Finland, KIINKO Real Estate Education, LocalTapiola, Newsec, RAKLI, SATO, SEB Group, Sirius Capital Partners, Skanska and YIT. Printed reports can be ordered from kti(a)kti.fi (price 49 € + VAT).